John Payne, whose One Arm Bandit Co. has been recognized as PRCA Specialty Act of the Year on multiple occasions, will be part of the festivities at the Dodge City Roundup Rodeo, set for next month. DODGE CITY, Kan. – John Payne nearly died 43 years ago. He was electrocuted, fell 25 feet to what could have been a certain death, then revived by his work partner. It was an event that changed his life that led to the amputation of his right arm. It has defined him in more positive ways than anyone could have realized. Payne is a cowboy; when he has faced adversity, he tackled in head on like most cowboys would. He turned the potential tragedy into a lifelong pursuit of everything cowboy and has become one of the most decorated specialty acts in ProRodeo. He will return to western Kansas this summer for the 40th edition of the Dodge City Roundup Rodeo, set for 7:45 p.m. Wednesday, Aug. 3-Sunday, Aug. 7, at Roundup Arena. His rodeo career began about 30 years ago, when he went to an event close to his home. He told the folks at the Ponca City, Okla., rodeo that he could get a better act if they hired him. He put something together, then went back to ranching. Shortly thereafter, legendary rodeo announcer Clem McSpadden – the longtime voice of Roundup Rodeo – made the call to Shidler. He has, and he’s one of the most sought-after acts in the game. That’s probably why so many events try to get the One Armed Bandit back to town as often as possible. 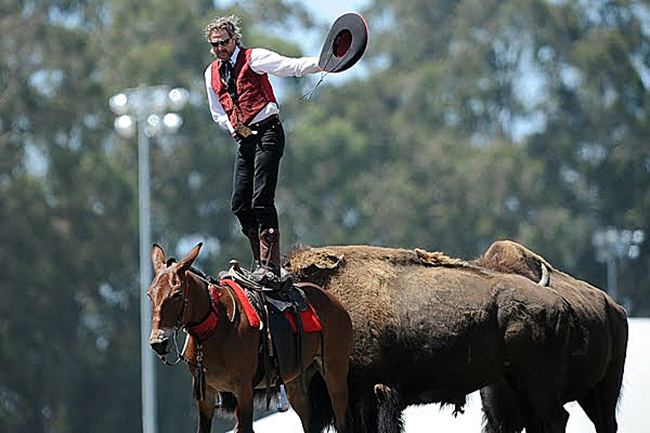 Payne has a custom trailer, which allows him and the animals a high perch to show off to the fans. It takes guts and a real horseman to handle the intricacies of the act. “First of all, he’s got one arm,” said Boyd Polhamus, a four-time PRCA Announcer of the Year and the voice of Roundup Rodeo. “It’s one thing for someone to do it. It’s amazing in its own right, but John’s got just one arm. No one else can copy that. There are many great acts associated with ProRodeo, but none provides the flavor of the One Armed Bandit. That’s just what rodeo fans in western Kansas have come to expect with Roundup Rodeo.